This strikingly beautiful Ocean Jasper has colors of tans, olives and greys running through it making it so easy to match any outfit. 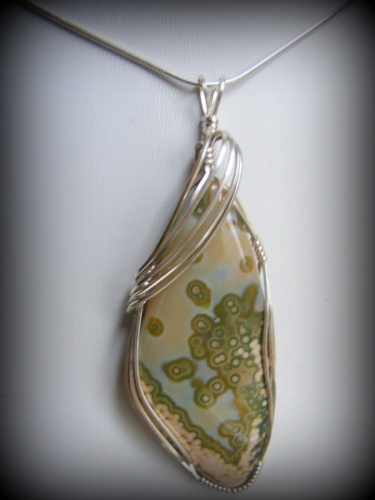 Modern wrapped style with sterling silver swoop framing it, makes this piece one of a kind. Measures 2 1/2" long from top of bail to bottom of stone and 1" wide. Comes with a sterling silver snake chain.